Simple, Effective Time Capture solutions for Jobs & Payroll, from the workshop or offsite. For clients running Sybiz Visipay and or Sybiz Vision we recommend TimePlus from Plus Software Solutions. TimePlus is a robust solution that allows staff to capture time in both Workshop / Office environments and via a mobile phone or tablets from out in the field. The solution allows a single timesheet of an employee to be captured per day, which can be used not just to pass into Sybiz Visipay for payroll hours per employee, but can also be passed to Sybiz Vision Job Costing to update Jobs with the employees hours spent on each job. This significantly reduces double handling of timesheet entry and speeds up the data entry process, meaning key reporting data is always accurate and up to date. 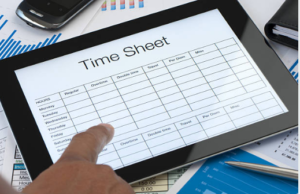 Managers can approve Timesheet hours before they are posted to either system, and can edit Timesheets making changes as required. TimePlus can also calculate employee Normal Time, Time & Half and Overtime based on rules that can be configured, either using set times or hours based duration. Employees can capture time through one of 6 different capture screens including Finger Print scanning so the solution can be as simple of detailed as required.